Flowering landscape trees are the crown jewels of the yard. Perhaps no other plants, individually, can have as great an impact on how a yard looks in spring. Learn about some of the best varieties for injecting color into your landscaping, beginning with star magnolia (Magnolia stellata). It is one of the first plants to bloom in spring and can be kept compact through pruning if you do not have room in your yard for a huge tree. Flowering dogwoods (Cornus florida) offer more than just spring blooms. For added value, these flowering landscape trees display pretty fall foliage. The colorful berries that they bear add further spice to your yard in fall. And, for good measure, they afford interesting branching patterns that show up best in winter (after their leaves have dropped). Kwanzan cherry (Prunus serrulata Kwanzan) has an upright, rather than a weeping form, but it puts on just as good a flowering show in spring as do the weeping cherries. So does Yoshino cherry (Prunus x yedoensis), which can be grown in USDA planting zones 5 to 8. Yoshino stands 30 to 40 feet tall, with a similar spread, and has white to light-pink flowers. 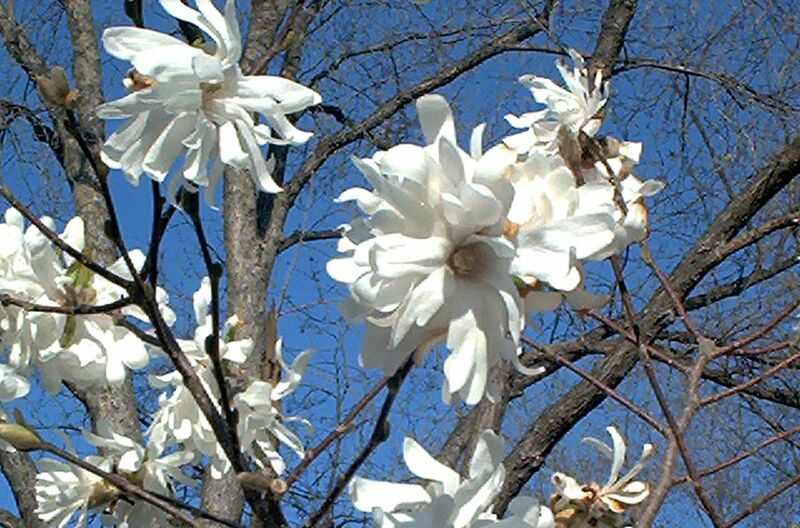 The various kinds of saucer magnolia (Magnolia x soulangiana) are often bigger (and with bigger flowers) than star magnolia. They also often bloom a bit later. But they are worth the wait, especially if you prefer pink flowers to white. The name, "saucer," is meant to suggest the large size of the blossoms. Like flowering dogwood, the redbuds (Cercis canadensis) are indigenous to North America and among the best flowering landscape trees of the spring. Their flowers are not large, but they stand out from the other entries on this list due to the fact that these blooms line otherwise bare branches when they first appear, as if the limbs were being coated in a pinkish-purple fuzz. The fact that they tolerate partial shade is another plus. They are about 20 to 30 feet high and wide and can be grown in zones 4 to 9. Do not let the bad press that one cultivar of callery pear (Pyrus calleryana) has received turn you against the whole species. The Bradford cultivar has become a black mark against callery pears, because this cultivar has weak branches that snap off during wind storms, after heavy snowfalls, or due to thick ice build-up. Newer cultivars are now on the market that are superior. Redspire is one, and it is a good one to cite, because its colorful name will remind you that ornamental pear trees also offer you as nice a fall foliage as any of the bigger trees known for their colorful leaves in autumn. One challenge to achieving continuous sequence of bloom in the landscape throughout the spring is that many of the best flowering landscape trees come into flower in early spring or mid-spring. Fewer choices are left over to grow in late spring. Common lilacs (Syringa vulgaris) may come to mind, but they are classified as shrubs, technically. Hawthorn trees flower in late spring to early summer. 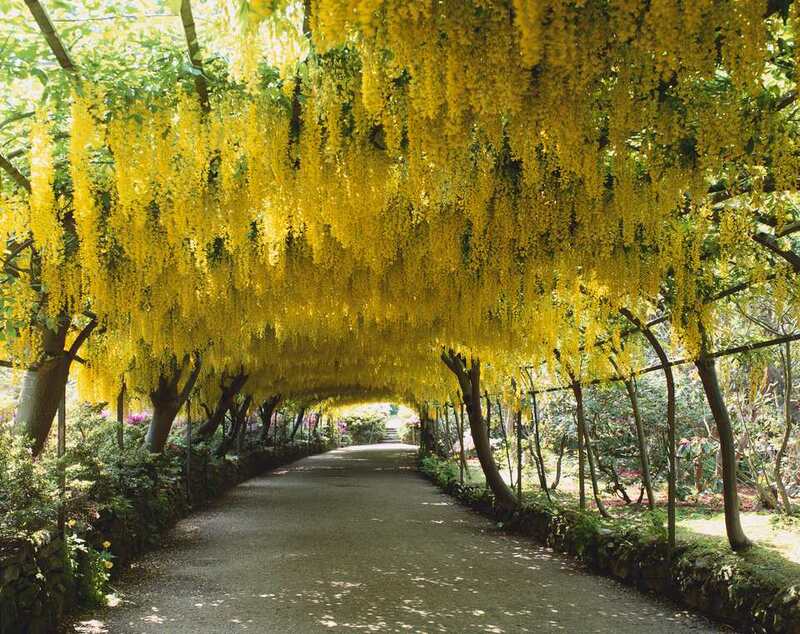 If all of these trees with pink or white flowers have you yearning for a different color, consider growing glorious golden chain trees (Laburnum spp.). True, they are fussy, like the Goldilocks of fairy-tale fame. They will not grow just anywhere, which is why they are not as widely grown as the other trees on this list. But if you have a suitable climate in which to grow them, then do so. They are fabulous trees and bloom in late spring, just as the hawthorns do. If you wish to follow up all of that spring color with terrific summer color, consider crape myrtles (Lagerstroemia). A popular choice in flowering landscape trees for Southerners, they have a long blooming period (mid-summer to fall). Their flower clusters come in pink, white, red, and lavender. The clusters appear on the tips of new wood. Northerners (to zone 5) can sometimes get away with treating these colorful specimens as shrubs that die back in winter but come back in spring.